Many of the artists featured in the special exhibition Van Gogh to Pollock: Modern Rebels, Masterworks from the Albright-Knox Art Gallery are also represented in the collection of the Milwaukee Art Museum. This is the second in a series of blog posts that will highlight Milwaukee’s artworks during the run of the exhibition. Wassily Kandinsky (Russian, 1866–1944), Fragment I for Composition VII (Center), 1913. Oil on canvas. Milwaukee Art Museum, Gift of Mrs. Harry Lynde Bradley M1958.12. Photo credit: Larry Sanders. Only one artwork from the Milwaukee Art Museum’s own collection is displayed as part of the newly-opened Modern Rebels exhibition: Wassily Kandinsky’s Fragment I for Composition VII. When one reads the title of the equally vibrant artwork from the Albright-Knox Gallery hung next to it, the reason for its inclusion becomes instantly clear. Fragment I for Composition VII, meet Fragment II for Composition VII. 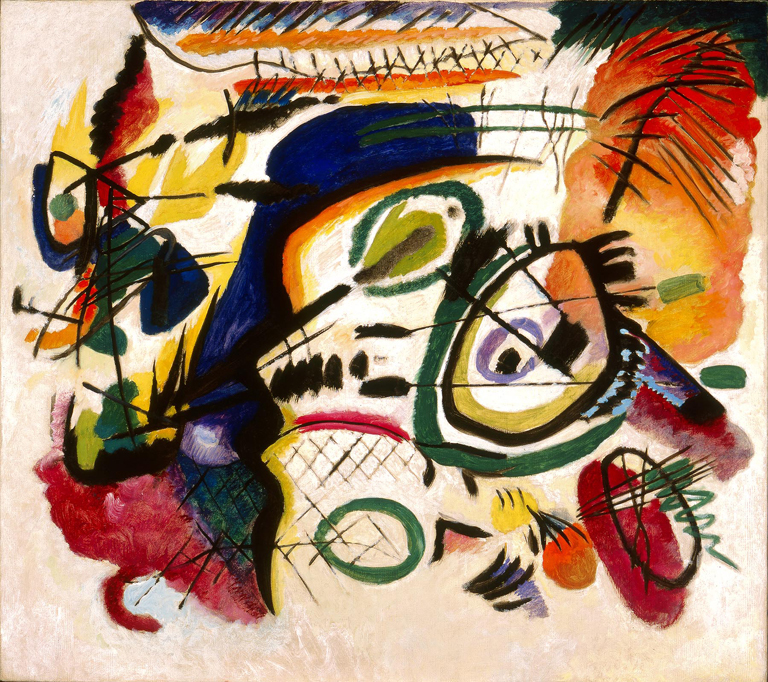 The paintings visually complement each other, both full of the rich hues and swirling forms that characterized the latter half of Kandinsky’s painterly career. It was at this time, during the tumultuous years immediately preceding World War I, that Kandinsky shifted fully away from representational artwork. He began to focus instead on the expression of pure emotion through shape and color, in a style that would eventually earn him the title “Father of Abstraction.” The paintings that he created during this time were often on a grand scale, seeming to envelop viewers in their whirl of vivid, overlapping forms. Fragment I and Fragment II are both studies for different parts of one such larger work, simply titled Composition VII, which is in the State Tretyakov Gallery in Russia. Yet, interestingly, when writing about these later works, Kandinsky maintained the existence of certain intentional elements and motifs. He insisted that the paintings were not merely meaningless jumbles of shapes, but instead conveyed specific emotions and themes via their deliberate arrangements of form, line and color. His inspiration for Composition VII was the Apocalypse – highly relevant to his experiences living in pre-WWI Germany. Certainly, once one hears the elements of this painting described as “a boat,” “mountains,” and “a figure,” it can be difficult to see the shapes as anything but these figurative forms, with their accompanying apocalyptic symbolism. Yet at the same time, even an unknowing visitor gazing upon the chaotic composition and contrasting colors of “Figure I” will likely feel a sense of unease and perhaps even impending doom. So, is the knowledge of the possible meanings behind Kandinsky’s forms necessary for a full appreciation of the work? This is just one of the many questions that Kandinsky’s paintings raise about the nature of art itself. Can an abstract painting still have meaning? Can an artwork be non-representational and yet incorporate symbolic forms? How much should the viewer consider the intentions of the artist (or the writings of scholars) when experiencing a work of art? Both casual museum visitors and academics within the art world still grapple with many of these quandaries today. Yet whether the paintings are seen as symbolic or purely abstract, one aspect remains universally true: Kandinsky’s Fragment I and Fragment II present a powerful, evocative experience for all who gaze upon them. This entry was posted in Art, Curatorial and tagged 20th century art, European art, From the Collection, Kandinsky, Modern art, Modern Rebels. Bookmark the permalink.